Disclaimer: This is just a joke. It's not meant to be taken seriously. Spondyville does NOT recommend anyone actually do this. Please follow your doctor's advice. Well, this past Labor Day weekend was a memorable one in Spondyville. 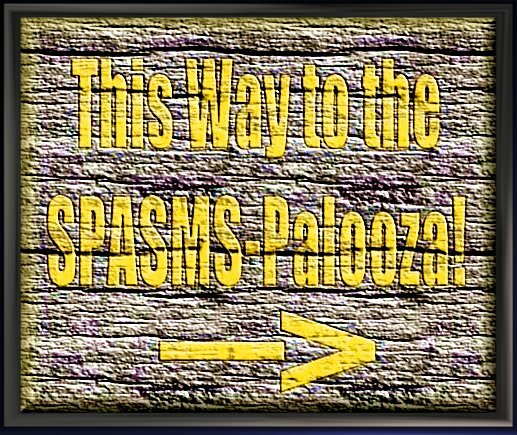 The Spondyville Pre-Ankylosing Spondylitis Meds Society, held their much-publicized "Stiffboree" or "Spasmspalooza" at the campground near the Old Fairgrounds, and while it was well-attended, it was, without a doubt, a complete disaster. 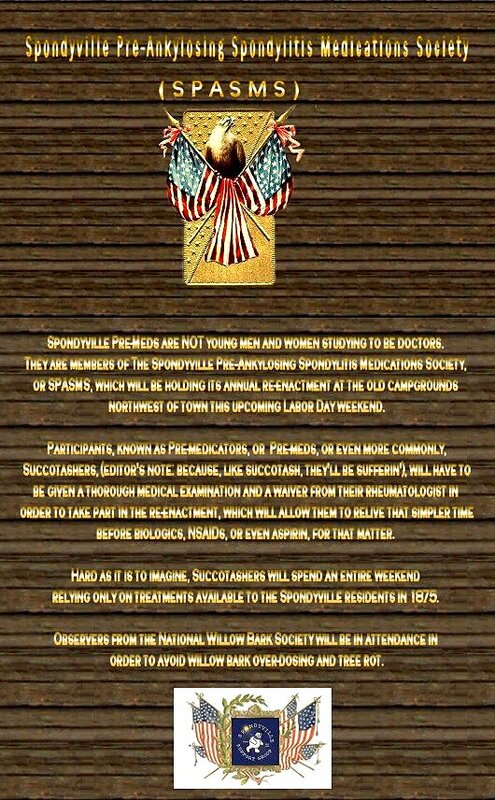 A crowd of Spondys, estimated to be in the hundreds, spent anywhere from three days to two and a half months without taking any meds or participating in any treatment option not available to the founders of Spondyville in 1875. 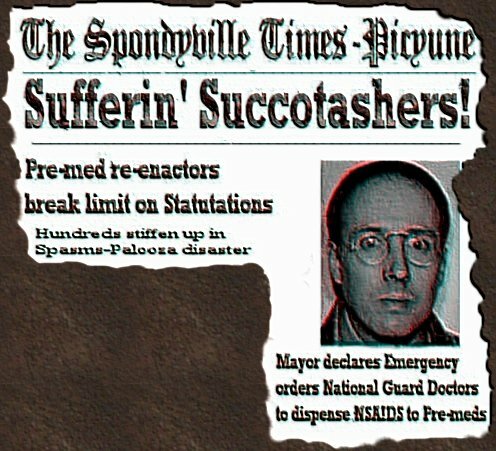 The much publicized Stiffboree, also known as the SPASMS-palooza, ended with hundreds of local residents becoming completely “statue-fied.” “Statue-fied” is a condition, wherein a person with Spondylitis becomes completely frozen and unable to move ... at all. As I’m sure you can imagine, Constable Crimp (the cop with a limp), and his deputies had a heckuva problem on their hands; first, there were all those campfires and nobody that could bend over to put them out. Fortunately a storm front moved in late Sunday evening and put out the fires, however, many of the re-enactors who had become statue-fied were then unable to bend down to get inside their pup tents, and a number of the ‘statue-esques’ who started out admiring the night sky, almost drowned during the ensuing rainstorm. Most residents were simply released on their own recognizance, but a few of the more severly affected had to be forklifted into the back of a truck, given IV biologics and returned to their homes to await recovery. The Spondyville restaurant community stepped up to the plate and kindly donated food and drinks to the Statue-fied for the duration of their ordeal. Spondyville town handyman, "Pops" DeMaupassant was heard muttering about having to work overtime to clean up the "d**ned" mess. And so it goes. Stay tuned for further developments.